Black Textured Dial, Luminous Hands & Hour Markers, Date Window displayed between the 4 & 5 o'clock position. 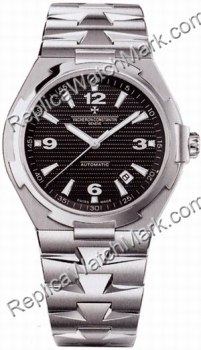 Bracelet links are integrated & designed after the "Maltese Cross" which is the Vacheron Logo. Aprox. Power Reserve of aprox. 38 hours.